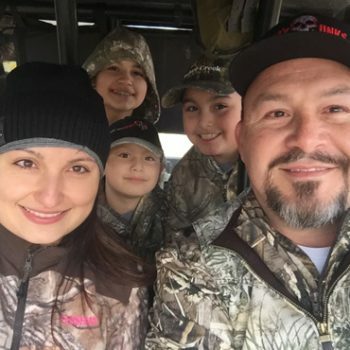 Head guide Joe senior police officer, metro police department, head guide/outdoor adventure coordinator for hunt with heart first and foremost, Joe is a devoted family man and christian, he absolutely loves spending time with his lovely wife and children in the outdoors making memories. Joe is married to his beautiful bride angelica of 20 years and has four children, xzavier 27, adriana 14 and twin boys aiden and evan 9; he also has one grandson zander 10 months old. he has been a police officer with the metro police department for 26 years and is currently assigned to the training division. Prior to this current assignment he was the team leader for metro’s swat team, where he also served as a sniper. joe has always had a love of the outdoors, especially hunting and fishing. he takes every opportunity available to enjoy the beauty of gods creations by immersing himself in hunting and fishing experiences. Joe has been with hunt with heart since april 2014 where he served as a guide for landon tyner and from that point on he was hooked! he always had a dream of helping children that were ill or didn’t have the opportunity to enjoy gods abundance in the outdoors. Joe currently serves as the head guide and outdoor adventure coordinator for hunt with heart. he is always eager to help in whatever way he can.